Spotify rolled out a new app today: Swarm.fm, which adds new social music features to both Spotify and Facebook, and offers a plethora of powerful features for actively discovering music from your friends, or sitting back and turning just about anything in the service, from tags to friends, into a personalized radio service that also reflects your own taste. If you haven’t heard of Swarm.fm before, that’s probably because it’s been hiding in stealth mode until this release, which constitutes “the first glimpse into Swarm.fm,” according to the start-up. The Swarm.fm app (video below) bridges gaps that previously existed between Spotify, Facebook, and your friends, allowing you to see and hear what all of your Facebook friends have been listening to in any Facebook-Connected music service — i.e. not just Spotify. In addition to listening to my friends' taste or all sorts of artist-driven discovery options, I can also track my own "swarm." And that’s just the beginning. To get started, you don’t have to authorize Facebook, but the app works better if you do because most (all?) of us have more friends in Facebook than we do in Spotify’s own social network. (Watts and co-founder Andrew Dever promise that the app won’t post stuff to your wall.) Regardless of how you register, Swarm.fm offers a short tutorial about each tab, which is crucial, because there’s a lot going on here. Swarm.fm’s Spotify app represents the culmination of quite a bit of evolution, from a neat Chrome extension that put play buttons all over Facebook even before Facebook launched its big music initiative last fall, to a music hack that won 10 grand at a Music Hack Day earlier this year, to this, today’s release within Spotify, which signifies the first time the whole vision has been realized, according to Watts and Dever, who are not shy about extolling the virtues of their creation. Listen to personalised mixes from any genre, mood, year or artist. It’s one thing to promise the world, and another to deliver it. So, how did Swarm.fm stack up? Overall, we found that it definitely added powerful social features to not just Spotify but Facebook too, that were otherwise missing. As I write this, I’m listening to an album from my old coworker’s band, Wooden Shjips, which I had somehow not known about. Really, that’s proof enough that it works — if I actually know a person and didn’t know about their album, a social music app would do well to let me know about it. That’s just what Swarm.fm did, in minutes. We found the Home screen to present a nice dashboard of what’s going on today with our friends, and with the artists in our “swarm” — basically, what we and our friends are listening to. Thankfully, you can “mute” friends if you don’t like their taste, and they’ll never be the wiser. You’ll also see new releases (and just about everything else in this app) personalized to your taste based on past Spotify behavior and local music library; Recent additions; artist profiles based on your taste (this worked great); and a tags section (which delivered an awesome krautrock selection). This versatility means you can either “lean forward” by actively seeing what your friends are listening to and researching artists to add to your own playlists — and you can play their activity not just on Spotify, but on any other Facebook Connect music service, which is the first time we’ve seen that. Or, you can “lean back” by turning any artist, friend, tag, year, or mood into a playlist/radio stream — all of which are informed by your own previous Spotify listening. 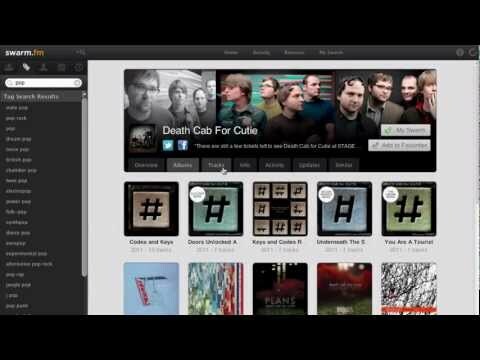 (Swarm.fm uses APIs from Last.fm and The Echo Nest, publisher of Evolver.fm for some of this.) And from the Friends section, you can also listen to instant mixes based on their favorite tracks, or delve into their entire collection of Spotify playlists. You can also do the latter in Spotify’s own social network, but again, you’re likely to have many more Facebook friends, which makes this a new feature too. On top of that, Swarm.fm has its own social network, so if you just want to add someone in Swarm.fm to track their music, but don’t want to go so far as to “friend” them, you can. The Activity page is our favorite aspect of this app, because as mentioned up-top, it gives you something that neither Facebook nor Spotify does on its own: a simple, unified interface for seeing what your friends Liked on Facebook, or listened to in Spotify or any other Facebook Connected music service, and turning all of that into easy on-demand listening playlists or radio stations. This activity is sliced into three categories: Recommendations (the stuff you’re likely to like, which worked great); Top Friends (these are people on Facebook or Swarm.fm whom you pick manually); and All Activity (a combination). Finally, Swarm.fm puts all of your own Facebook artist Likes, Spotify starred songs, and Swarm.fm favorites in one place, so you can more conveniently keep track of your own taste, in addition to that of your friends on all three social networks. Whew. You can try the Swarm.fm app now by going here, or by installing it from the Spotify App Finder.